It's not easy to promote your business online. There are plenty of obstacles you can find on that way, and every way of promotion has some benefits and disadvantages. An email campaign is one of the most effective ways to promote, according to experts and finding the best email marketing software can be difficult. With our top 5 list we have made it simple to find the best tool for the job. Of course there are literally hundreds of email marketing solutions, so, in order to help you choose, here are the top 5 according to experts. 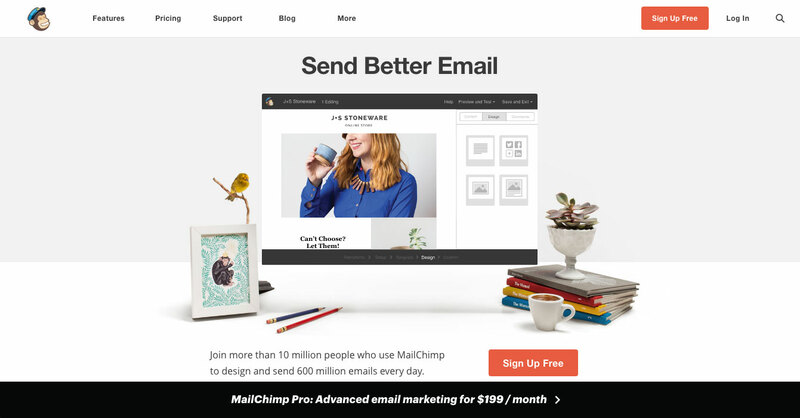 If you choose Mail Chimp, you will get very simple, but effective email marketing software to work with. You can choose between the free version and paid one, which will cost you between 15 and 240 USD per month. The free version supports 2,000 subscribers and 12,000 emails per month. If you need more, you will have to pay it. It contains all usual tools to create, manage and track your email campaigns. You can use it on most mobile platforms and integrate it with many apps. If you need support, you will have to deal with the self-service, since there is no live support. It is very simple to work with iContact. There are several predefined models you can use. All you have to do is add a list of emails from your customers. This is a great solution for all beginners and those who do not need some sophisticated solutions. If you need them, there are tools you can use. Free version can work with 500 subscribers and 2,000 emails per month. For more than that, you will have to pay 10 USD for every 500 more subscribers and it can go up to 699 USD per month for 100,000 subscribers. There are several self-service support options and if you need it, there is a live phone support as well. If you are looking after cheap and simple email marketing tool, you should definitely try Aweber. The price starts at 19 USD per month and goes up to 149 USD, but you can get a lot for that amount of money. There are several simple templates and segmentation capabilities you can choose from, which makes this tool interesting to all companies which are looking after a cheap, but effective hosted solution to create and track different email campaigns. Unfortunately, it does not support mobile platforms and you can't upload pictures to their server. Small companies which are just starting their email marketing campaign should consider Constant Contact since it is their specialty. You can upload documents and images to the Constant Contact service, all together in 5 MB of space. If you need it, you can buy more space, as well as some advanced sorting, social media, photo and management features. Price starts at 15 USD per month to 150 USD per month for up to 25,000 subscribers. For that money; you can launch an unlimited number of campaigns. All this comes in a package with a first class customers support for your email marketing software. Campaign Monitor is offering you a very simple way to upload your data and pictures, create very appealing emails and send them to people from your subscribers list. Once it is done, it will create simple and understandable reports for you. Only problem is the price; it starts from 29 USD per month and if you want to send unlimited number of emails the cost will be much higher. However, many business owners think it is worth it for their email marketing software needs. In conclusion, finding the best email marketing software can be difficult but with our list of the top 5 we have found, you can be sure that you now have the best solutions out there.